As I mentioned at the end of Part 2, my plan was to write to Event Cinemas and ask if they had a policy in place that prevented individuals from buying more than one (1) ticket to films rated MA15+. 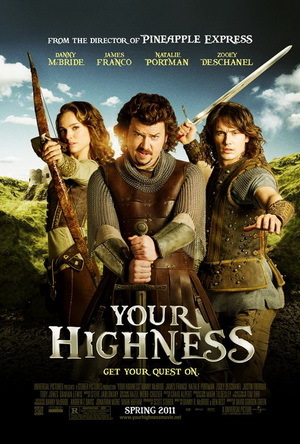 I haven’t written to them yet – but earlier this week, when my friend and I agreed to see the MA15+ fantasy comedy Your Highness, I decided to conduct an experiment. An hour or so later when my friend arrived at Star Bar to join me for dinner, I presented the results of my experience and he was similarly intrigued. What did those results mean? Has Event Cinemas recently abandoned a policy that prevented individuals from buying more than one (1) ticket to MA15+ films? Is such a policy still in place – but has there been a process failure in keeping all staff informed? Did I come across as very alpha and not to be trifled with, and so the policy was waived for my situation? 1 is not impossible but rather unlikely, and 3 is very unlikely, so I favour 2. Whatever the reason, I now have something more to add into my eventual query to Event Cinemas. And Your Highness was stupid good fun – especially if you’re a former role-player like me, as several moments in the film reminded me of game incidents where character decisions, dice-rolls or both went unexpectedly well or catastrophically wrong. This entry was posted in Action, Life Challenges. Bookmark the permalink.